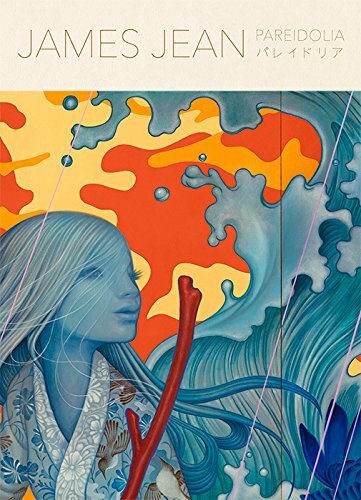 Here's another amazing compilation artbook from James Jean. A few months ago, I wrote about James Jean's 292-page XENOGRAPH, an artbook that was supposed to be crowd-funded. Based on the page previews I see, it seems that much of the content is duplicated here. Even the quote by Guillermo del Toro is reused here. I did not get that book because the shipping cost USD $56. Anyway, those who did not get the 3,000 limited edition XENOGRAPH can now rejoice with Pareidolia, the new retrospective artbook of James Jean's career. This artbook is published by PIE Books, a Japanese publisher and they have made this available on Amazon Japan which is where I bought this book. It will be available soon worldwide with much reasonable shipping rates. It's a huge paperback book with a dust jacket that you can unfold into a giant poster. The book has 302 pages. Printing quality is excellent. The choice of using paperback isn't really appropriate in this case. As the book is thick, many of the double page spreads are affected by the gutter as the pages curve in. It's not too bad but this is James Jean we're talking about. It would be best to view his art without such distortions. The artworks featured are amazing, as expected. However, you'll see a lot of duplication from his earlier books, such as Rebus, Rift and Kindling. His work for Fables are not included, thankfully. The artworks you'll see are his commercial and personal pieces. Many are full coloured paintings, some sketches from his Moleskine sketchbook, commissioned work from Prada and many more. All of them have elements of fantasy and surrealism that you've come to expect from James Jean. How he can produce so many pieces of art at such high quality is just astonishing. For a retrospective artbook of his career, I wished that there was at least some form of writeup, a mini biography perhaps. You do get a list of past exhibitions, special projects, publications that he's involved in. There's also an index at the back and it has some interesting information, such as how humungous some of the works actually are in real life. How much new works are there? Well, the 240-page Rebus was released in November 2011 and this book was released this year. So you're going get about 4 years worth of new content. However, note that the bulk of his work still comes from before 2011. I did not go and compare exactly how many pieces of new works there are. It would be too tedious. Is this book worth it if you already have Rebus? Ultimately, your purchasing process will come down to this: But there's a lot of duplicated content. But it's James Jean. But there's a lot of duplicated content. But it's James Jean. But there's a lot of duplicated content. But it's James Jean. But there's a lot of duplicated content. But it's James Jean. But there's a lot of duplicated content. But it's James Jean. But there's a lot of duplicated content. But it's James Jean. But there's a lot of duplicated content. But it's James Jean. But there's a lot of duplicated content. But it's James Jean. Every time I review a new edition of a book, I get readers who ask me whether they should get the newer edition despite the duplicated works. I find that really difficult to answer. Seriously. But it's James Jean we're talking about here. The dusk jacket will fold out into a poster with this artwork.